The Amityville Haunting– Truth or Fiction? In December, 1975, the Lutz family moved into a large Dutch colonial at 112 Ocean Avenue in Amityville, Long Island, their dream home. They’d managed to buy the property at a bargain price as it had been on the market for over a year. No one else wanted the house, because of its dark history. This was the house where, 13 months earlier, Ronald DeFeo Jr. murdered his entire family, his mother, father, two brothers, and two sisters, with a 35-Marlin rifle while they slept. Knowing that information didn’t deter the Lutz family from moving in to the house, but they didn’t live there long before they began to experience a bizarre chain of terrifying events, which caused them to flee their new home in terror 28 days later. Afterward, in conjunction with George and Katy Lutz, Hollywood soap opera writer, Jay Anson wrote a best-selling story about the haunting, called the “Amityville Horror,” which catapulted the house and its dark history into eternal fame. A movie, starring Rod Steiger, Margot Kidder, and James Brolin followed. Then Dr. Stephen Kaplan, a well-respected Long Island parapsychologist and the founder of the Parapsychology Institute of America, came into the picture, conducted some research of his own, and denounced the story as a hoax. But was it a hoax or did Kaplan also hope to cash in on the house’s infamy? Was the house haunted by some dark force that not only drove the Lutz family out but also possessed Ronald Defeo Jr. and made him kill his family? I decided to attempt a psychic connection in hopes of answering these questions. Preliminary Thoughts: After reading books on the Amityville case years earlier, I went into this investigation with some bias, but I always strive to remain open-minded during investigations. As it had been over 25 years since I’d read anything about the murder and haunting, the details were far from fresh in my mind. I’d always thought that the house was haunted, but that the Lutz story was unbelievable, because too many different “types” of supernatural phenomena were reported to have happened during their short stay in the house. The only other comparable case that comes to mind is the Bell Witch haunting. When rumors that the Amityville haunting was a hoax circulated in the 90s, I thought that would be the end of it, but something called me to return to the case after all of these years. And I’ve learned that the truth is not black and white as some would have you believe. In fact, even today, there’s a great division in opinions on the subject, and just what happened in that house during the Lutz stay remains a mystery. I usually never attempt to connect to a case where a demonic or evil force could be involved as it could put me in danger. But true demon cases are rare. A majority of hauntings are the result of deceased human spirits–not demons. And I, like many others, wanted to know the truth. So, I decided to take a peek and see what’s in that house. Before I began, I prayed for protection from evil. I focusing on seeing the house at the time of the supposed hauntings, and I immediately connected, finding myself inside the house. I’m not sure what room as the image was too hazy, but I was on the first floor and the walls were white. I believe I was in the hallway. I also saw the vague misty images of several spirits roaming the house, what I believed were deceased humans, in the form of shadow people as I’d expected. These souls are earth bound, in torment, either not accepting that they’re dead or are grieving about it. I watched the spirits aimlessly move about for a bit and then, to my surprise, I saw a spirit with red, glowing eyes. I couldn’t tell you what kind of body it had as I couldn’t make out the shape–only that the body was dark and seemed to meld into and become part of the environment. But I got the sense that it was humanoid in form. I wasn’t overly alarmed as spirits can look like this. Yes, spirits with red eyes are often thought to be negative entities. I’m not sure about that though as it didn’t inspire fear, and there weren’t other “demonic” signs–such as a foul odor or strange voice. And I think these red-eyed spirits that are sometimes seen, require further investigation and research. They may be nothing more than a physical manifestation of a very troubled soul. I’ve seen many other ghost forms during my life, including shadow people, orbs, and full-bodied apparitions, but I’d never seen a red-eyed spirit either in a vision or outside of one before, and I’ve only come across them a few times in haunting accounts of which I’d always been skeptical. But here it was, a red-eyed being. I remember that George Lutz had mentioned a pig with red, glowing eyes in his accounts of the haunting. Perhaps this is the same spirit–though I feel that the creature I saw was not a pig in the true sense. That was one of the subjects in his account that I’d thought was fictional. Apparently it was not. Though most of the images were difficult to make out as shadow people typically are, I repeatedly saw the manifestation of a young girl with dark hair, sitting with her head in her lap and crying piteously. She wore a dress. As the images shifted, so did my vision. I saw her in several areas of the house–in what I believe was a bedroom, on the main staircase, and elsewhere. Each time, she was in the same position and crying. I saw her clearly as if I was looking at a living person before me, but I never saw her face. I didn’t remember what the victims looked like as it had been so long since I’d seen their photos, but I later looked up photos of the DeFeo family, and I’m certain that she was one of the girls, either Alison or Dawn. But I’m not sure which one as they looked much alike and both had lovely, dark hair. I asked if there’s something evil there and continued to see the spirits moving about and then something alarming came into view, a woman with wavy, shoulder-length, blue black, hair in a style typical of the 1970s. Her skin was so fair that it seemed almost white like something you’d see in Goth artwork. She wore a clinging pale gown, or maybe it was even a slip. And I saw her face from the front, up close, as if she were standing in front of me and staring directly at me. My fear grew as a short, red, glowing snake emerged from the dark circle of her right eye. Snakes are symbols of evil. The Christian bible uses the symbol of the serpent in the Garden of Eden to represent Satan. Some would argue that the serpent also has a positive meaning, representing strength, protection, and even the universal life force. That’s true, however, you have to take a symbol in the context in which it is displayed, and this serpent was not presented in a positive way. Far from it, the serpent gave me bad vibes. I believed the snake represented danger and possibly evil. The vision scared me so much that I tried to break the connection, but was unsuccessful, and I continued to see the shadowy images of spirits and the woman until she finally disappeared. Once she was out of the scene, I calmed down a bit and decided to continue my investigation. I asked where the evil is in the house, and was repeatedly shown the main staircase. I don’t know why. As I studied the staircase, looking for some clue or explanation, my fear heightened. Was I supposed to go up the stairs? I didn’t want to, felt that I shouldn’t ascend those stairs. In fact, I wanted to stop, but something was pulling me in…deeper and deeper. I finally managed to break the connection. Relief filled me. I never wanted to go there again, but I did. Against my will. I connected, very briefly, twice a couple of days later, during the research phase of my investigation. The visions began on their own, which happens occasionally when a spirit wants to give me a message. In these visions, I saw Ronald Jr. kill Dawn and Allison. I will describe these psychic impressions below. What does this all mean? It tells me that the house was haunted when the Lutz family lived there. But one fact doesn’t necessarily refute another. Just because the house was haunted doesn’t mean that the Lutz family didn’t move in with the hope of perpetuating a hoax and profiting off of the story. What I saw tells me that at least some of what they said was true. I don’t know who the woman with the snake eye was. Her physical description doesn’t match that of the DeFeo mother, who was blonde and much older. The woman looked more like the girls, and had the similar wavy, dark hair, but she was older–in her late 20s or early 30s. Was she, in fact, one of the girls, the same weeping girl I’d seen earlier in my vision? Perhaps she wanted to appear older. The short, red snake I saw coming out of her eye, may represent that her life was cut short due to another’s evil act. And perhaps she grieves because her life was taken from her, and she will never grow into that beautiful lady she envisioned herself becoming. Or perhaps this spirit is someone else entirely–not a woman at all, but something evil that was trying to trick me and pull me in. It’s also important to note that the color red stood out in this vision. The snake was red, and I saw another spirit with red glowing eyes. My visions are ordinarily in black and white so if I notice a color, it has major significance. But again, there’s duplicity of meaning here. Red can represent strong emotions such as passion, love, hatred, ire, and excitement, but it can also represent energy, speed, strength, danger, evil, and power. Red is also an attention getter. So perhaps, again, I was being given a warning that danger was near, or, as I’m more inclined to believe, the girl with the dark hair wanted me to know how much she grieves for the precious possessions that she lost–her life, her hopes, her dreams. I do believe that this girl was the dominant spirit in my vision, the entity that I connected to, and the world that I was seeing was hers, her hell that she’s locked in. As for demons, despite the red-eyed spirit I saw, I’m not convinced that there were demonic forces in that house. Again, I believe that demons are rare. After what I saw in this vision, however, I do believe there was strong negative energy in the house when the Lutz family lived there that stemmed from the murders. As for other mysteries surrounding this case, I decided to break it down into various sections, covering the most debated topics. There are many questions about the murders. Why were the victims lying on their stomachs? Why didn’t anyone hear anything that night? And what is the significance of the bloody shoe? And most of the all, was Ronald DeFeo possessed or influenced by a satanic force? Most of these questions can be answered without psychic research, by looking at the facts and using a bit of logic. I had read the Hans Holzer book on the murders years ago, which includes snippets of an interview with Ronald Defeo, and I had always thought that Holzer misinterpreted Ronald DeFeo’s statements and falsely concluded that Defeo was possessed at the time of the murders. In fact, I believe that Holzer had hoped to profit off of the case as did many others who’ve come along since. Even if DeFeo had clearly stated that he was possessed, he has changed his story so many times that nothing he says can be taken seriously. Killers usually say they didn’t do it, someone else did it, or they fake madness–especially sociopaths who can’t take responsibility for their actions. Ronald, to this day, denies his role in his family’s murder. In one version of his account of the events, he states that his sister Dawn and a friend is responsible for the murders. But he does this only in hopes of alleviating himself of guilt in hopes getting out of prison someday. Let’s hope they never let this sociopath out of prison! I fully believe the police got the right man. No one else was involved, least of all Dawn. Someone else knew that Ronald wanted to murder his family though–one of Ronald’s friends. I sense that Ronald mentioned his murder plans to this friend on more than one occasion, but the friend thought that Ronald was just blowing steam, that Ronald didn’t really mean it. The friend just couldn’t imagine how one could actually do something so awful to their own family. I feel that this friend, even today, feels immense guilt, because he didn’t report it or try to stop it. But in truth, it was out of his hands. There was nothing he could have done. Warning the family certainly wouldn’t have helped. The Defeo family already knew Ronald was dangerous as he’d threatened to kill his father before and nearly did on at least one occasion. During a fight between Ronald Senior and Louise, Ronald Jr. had interrupted them by sticking a rifle in his father’s face. He pulled the trigger with the intent to kill, but the gun never went off. But was a dark force involved in these events? Was Ronald DeFeo possessed when he killed his parents? No. He was merely a greedy, sociopath, and a drug addict to boot who hoped to collect on his parent’s $200,00 life insurance policy. A deep angst existed within the family, and many articles have mentioned that Ronald DeFeo Senior had been harsh to Ronald throughout the boy’s childhood. Yet, when Ronald became a major discipline problem, even getting kicked out of school, the DeFeo family took a different turn and spoiled him. Instead of discipline, they’d given him money, a car, and a salary, but he wanted more, needed more to support his heroin habit. He and a friend even went so far as to stage a phony holdup while Ronald was transporting some cash and checks to the bank from his grandfather’s Buick dealership about a week before the murders. In fact, a night or two before the murders, DeFeo and his father had gotten into a fist fight in the basement over the phony hold up. This fight probably triggered Ronald’s murderous rampage. Was someone else involved in the killings? I only saw Ronald in my vision! It’s a shame that theories abound about Dawn being involved. In a way, this makes her a victim a second time around and is a great injustice to her. I sense that she did have some angst for her parents, especially her father, and sometimes she might have expressed that to Ronald Jr., but she was never serious about hurting anyone and was, in no way, involved in his murder spree. It’s ludicrous to believe that she would have helped him with the murders, then got in bed and let him kill her too. Why didn’t anyone hear anything that night? I don’t know. From what I saw in my vision, I believe some of the family members did awaken from hearing the gunshots. As for the neighbors, 3:15 AM is about the time that one would be in the deepest mode of sleep. There’s a lot of talk about a photo of a bloody shoe. To see this photo for yourself, click here. Some believe that this shoe proves that the DeFeo family was up and about during the time of the murders–that the victims were on foot and bled throughout the house. A crime scene investigator later said there was blood in various areas of the house. I disagree that the family members were roaming the house. And, in fact, the solution to this mystery is simple and requires no psychic investigation. I believe that the shoe was in the laundry area of the basement and Ronald DeFeo himself got blood on it after the killings. According to the transcripts, after the murders, he tidied up, had a bath, trimmed his beard, and even changed into clean clothes. I believe he went to the basement laundry room to get some clothes or possibly even some rags for the cleanup. In fact, he even lost one of the clothing articles on the basement stairs–see this crime scene photo. At any rate, for whatever reason, he went to the basement and the blood dripped from his gun, his clothes, or even his person, onto the shoe. If you look at the crime scene evidence that he tossed into a sewer on Sea View Avenue in Brooklyn, you’ll find that the holster and other items he used that night were drenched in blood. There has also been some mention on various websites that the picture was not taken in the DeFeo home because the baseboards were not consistent with those in other areas of the house. The house was built in 1924, and anyone who has ever lived in an old house knows that the baseboards are often inconsistent from room to room or floor to floor. Building supplies were not standardized back then. Besides, the originals would often be replaced for renovation or for other purposes. As for the blood in other areas of the house. Again, blood dripped through the house from DeFeo as he did his dirty deeds. None of the victims moved much after receiving shots like that, and one has only to look at the crime scene photos to see that they did, in fact, die in their beds. The pools of blood on the mattresses beneath each victim provides indisputable evidence. Why are all of the victims lying on their stomachs, and why didn’t anyone run or put up a fight? I’ve thought and thought about this and the only logical explanation is that DeFeo woke each person up, one by one, and told them, at gunpoint, to turn over. He might have even made up a story to keep them calm–perhaps he’d said that someone had broken in that he was handling it. Why would he do this? So that he wouldn’t have to see their faces when he shot them. Toxicology reports revealed that the family wasn’t drugged, and yet the police said that the family slept during the murder spree, but how could they possibly know that? Yes, there were no signs of a struggle, which is strange. You’d think that someone would have at least fought back, especially big Ronnie, but then again, a gun to the head is a big motivator. And they were all awoken from the deepest phase of sleep and were probably too groggy to think much at all. I strongly sense that big Ronnie was awake and that Ronald Jr. told him to turn over on his stomach. I believe that big Ronnie attempted to talk his son out of this to no avail. I believe the mother was awake through this too and heard her husband being murdered. I believe she begged him to stop. I saw Allison awaken hearing shots, and yet, she laid there in absolute terror, too afraid to move, and it all happened so quickly. She saw Ronald when he came to the doorway of her room with the shotgun, and, awaiting the inevitable, she buried her head beneath her pillow. Dawn had awoken too, probably early on, when Ronald had shot his parents. She was too scared to go downstairs or to investigate. She arose and attempted to hide in the closet, then under the bed, but he found her. Though I heard no exchange of words, I assume that at gunpoint, he told her to get back in bed and to turn over. After she did, he shot her. I think a lot of people just don’t realize how quickly these murders went down. It would only have taken him a few minutes. 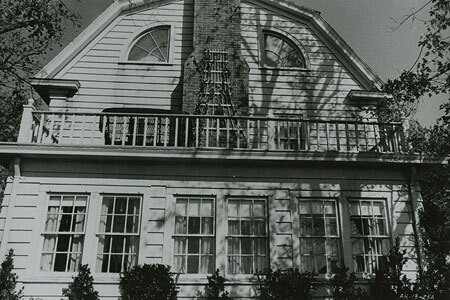 Was the infamous house in Amityville haunted when the Lutz family lived there? Of course. The DeFeo family was brutally murdered there by a close relative, someone they loved. They could not rest peacefully after that. And from what I witnessed in my vision, I’m certain that there was much more in that house than a bit of negative residue. Why haven’t recent owners seen anything strange? They either have experienced supernatural activitiy and are keeping quiet about it–after all, by all accounts, they’re overrun with curiosity seekers. They certainly wouldn’t want to draw more attention to the house by admitting to supernatural happenings. Or, they simply aren’t receptive. Some people can’t see, hear, or perceive spirits in any way just as those who are color blind can’t see green. And sometimes a receptive person, through no fault of their own, will serve as a catalyst that fuels a supernatural fire, making spiritual activity much more intense, bringing it to life. I think that was the case with the Lutz family. I believe that one or more members of the Lutz family possessed strong psychic ability. It’s also important to remember that the Lutz family were the first people to live in the house and shortly after the murders. That would have been quite a shock to spirits that haven’t accepted their deaths. Perhaps the spirits have calmed down since then. According to Lorraine Warren, there has been no activity since, because the house was exorcised. What is the significance of the red room? At first, I thought it was just a space under the basement stairs–a lot of houses have odd spaces like that. There’s nothing sinister about it. But after giving the matter more thought and reading a bit about the history of the location, I believe I’ve solved this mystery. The first owner of the house owned another house on the location, a small cottage, which his growing family rapidly outgrew. He had the cottage moved (two blocks down the street) and built a new house on the spot. The new house was probably built, in part, on the existing foundation. Thus, the Red Room is mere a remnant of the previous structure. Why was it painted red? Who knows? Maybe there was a sale on red paint. Maybe someone just liked the color. Maybe the paint was left over from some other project. Red is a color that has gone in and out of style many times, and it was popular during the early 70s. Look at the crime scene photos, and you’ll see that a lot of things in the house were red. I don’t see any supernatural connection, and I picked up nothing about the red room during my psychic investigation. Was the Lutz story just a hoax? I don’t believe it was a hoax. Without a doubt, some of the happenings in the movie and book are mere fiction. But after my psychic investigation, I believe the house was haunted when the Lutz family lived there, and I believe that the spirits affected them. Some people don’t realize that George Lutz publicly claimed that a lot of information in the film and bestselling book wasn’t true to begin with. In a recent interview (just before he died in May 2006) George said that the house had changed him and had a negative effect on his thinking–that the house actually changed the way he thought as if he was a different person. He said his wife drastically changed too. I believe that his statements rang true. Any environment can affect one’s thinking, but throw in six brutal murders, and it’s easy to see how someone who’s psychically receptive could pick up on the negative energy. What’s more, most of the experiences the Lutz family had there were ordinary things that happen in haunted houses–being touched by unseen hands, seeing shadow people, hearing voices and other strange sounds, hearing footsteps on the stairs, and doors and windows opening by themselves. If it all seemed much worse than ordinary, that’s because it was as six of the spirits were brutally murdered. Still, all of that being said, that’s not to say that the Lutz’s didn’t hope to profit off the story and invented some things, and may have even purchased the house for that purpose, knowing that the murders took place there. Only George and Kathy Lutz will ever know for sure. Both of them are now deceased, but they swore to the end that their story is true. If they did move in solely to perpetuate a hoax as some believe, it must have been quite a shock for the Lutz family to find that the house truly was haunted. Besides the murder victims, are there other spirits there too? Yes. I don’t know who they are, but I think they’re innocuous spirits, possibly the first owner and his wife (No, I don’t think they influenced DeFeo). And I don’t think there they were involved in witchcraft or Satanism–I encountered this theory online. And there are no American Indian spirits there, and the house wasn’t built on an ancient Indian burial ground. The Warrens made this claim when they conducted a psychic investigation in 1976, and I disagree with their conclusions. I don’t think there are demons either. Learning the identity of the other spirits would require further investigation, and, at this time, I don’t wish to connect to the house again, because of the negativity I felt during my investigation. I read George’s latest interview, and he mentioned how his wife had suddenly aged and had said it was even “noticeable to her mother.” I’m afraid the answer to that is simple. She was the right age for peri-menopause–for some women this starts in their late 20s–and a lot of ladies age overnight when estrogen suddenly takes a dive. Early aging also has a genetic component. Did Mrs. Lutz really levitate? I’m skeptical about that, but it happened in the Bell Witch case so it’s possible. Were there flies in the house in the winter? Possibly. They could be attached to one of the unhappy spirits in the house. Did blood and green slime trickle down the walls? I’m skeptical about that. I never saw this in my visions. George claimed that some of the spirits followed him to California. Is this true? That’s a possibility. I’ve encountered cases where a spirit will even follow someone home from a cemetery. Sometimes, they attach to certain people, because that person is receptive, and they want to communicate with that person or be near that person in order to draw on their energy. Often, if asked to do so, an innocuous spirit will leave. What about the Ghost Boy? This photo was taken in the house during the Warren investigation after the Lutz family fled. I don’t think it’s a demon at all, and if the photo is genuine, it looks more like the spirit of one of the DeFeo boys. As I studied the image, I was pulled into a vision against my will. I asked who this boy is, and, strangely, I saw Allison, lying in her bed. Defoe stood in the doorway with the rifle. He aimed and fired. Her head moved a bit to the side and then back in the previous position. Does this mean that the demon boy is actually Allison? I don’t think so, but I don’t know what to make of it. I don’t understand why the photo evoked a vision of Allison. Still, this doesn’t look like the typical ghost photo I’ve ever seen. The eyes don’t usually look like that, which makes me wonder if it’s a fake. A real horror occurred at 112 Ocean Avenue in 1974 that was scarier than any fiction ever written. Six innocent people lost their lives at the hands of a madman. Had a powerful demon or other negative spirit influenced Defoe? It’s more likely that he was influenced by the mighty dollar bill. Drug addictions are expensive, and when you don’t have a conscience, anything goes. George Lutz and his family moved into the house on Ocean Avenue and fled with the claim that it was haunted. Of course, it was haunted, but only George and Kathy Lutz will ever know if their initial motive in moving in was making money. At any rate, whatever happened beneath that infamous gambrel roof, the house is determined to keep at least some of its secrets for the time being. Please note: The Amityville House is currently occupied by people who value their privacy like you do. This website does NOT condone visits to the house or the property, and we ask everyone to please respect the privacy of the current owners. The Amityville Police Department also patrols the neighborhood and discourages sight-seers to visit the house. It’s a little early for an update, but a few strange things have happened since I wrote this article and began my research. I’m beginning to wonder if I should have undertaken this investigation. I’m plagued with images of the victims every time I close my eyes. I strongly feel that one of the victims is trying to contact me–one of the girls. I have nightmares about the victims through the night, which often wakes me up. After one such torturous night, I awoke in the morning smelling blood and there was no source for it. Immediately after I finished this article, something stood behind me and tapped me on the shoulder. I have resident ghosts in my home–not murder victims, but innocuous ghosts that died of natural causes, and sometimes they do reach out. Hopefully, this tap on the shoulder was just one of them, trying to get my attention and saying: “Hey, don’t forget me.” I pray that I didn’t call one of the Amityville spirits to me by conducting my investigation. It didn’t occur to me until last night that George and Kathy said that at least one of the spirits followed them to California. Now that they’re deceased, the spirit could be looking for someone else to attach to. I probably wouldn’t have conducted my investigation if I’d thought of that beforehand. I awoke today, however, feeling that whatever it is is gone–so hopefully, that’s the end of it. Still, I can’t shake the feeling that one of them wants to tell me something. Two years have passed since my initial investigation, and I’m happy to report that whatever negative energy I’d connected to in this case is no longer bothering me. I’m still attracted to the case, and I think about it sometimes, but I feel that any negative energy that came into my house is now gone. After I shut the door, it must have given up and went away. Eight years have passed since my psychic investigation on the Amityville. I’ve grown tremendously as a psychic, and I’ve learned so much about the spirit world. I now have a much better understanding of things that I didn’t before, chief among them, the demonic. Looking back on this investigation, I now believe that there was a demonic influence in that house. I don’t know why it was there or for how long, but I believe the horrifying images I saw of the snake coming out of the woman’s eyes and the red-eyed being were demons. I was affected by something in that house for years after this investigation, and the thing that affected me was certainly not human. No human spirit would have that kind of power. What’s more, in reviewing this case, I felt that something was trying to pull me in again. So I will not make another connection to this house at any time in its history. Sociopathy could, in fact, be rooted in demonic oppression. The demonic oppression in that house is the reason for the strife in the Defoe family for years before the murders. Demons hate humans and want to cause us suffering, despair, and death. They’re always at work, a subtle voice in the background that affects our thoughts and actions. As they work to separate us from those we love and isolate us, their strength and influence grows. Sometimes they begin on a child while it’s in the womb and persecute that person for all of his or her life. Eventually, this influence changes how the persecuted person’s brain operates, and, thus, how the afflicted behaves, for these demons twist and mutilate one’s sense of self and world view. I was wrong in what I’d said about most houses being haunted by humans. Many hauntings are actually demonic in nature, and it’s best to avoid having any communication with ghosts as it could open doors. There’s always a battle going on between good and evil. In the Amityville case, evil won. As for the victim who kept trying to communicate with me, I believe it was Allison. I think she merely wanted me to know that her brother had killed her. As Ronald has often claimed that Dawn had a hand in the murders, and had recently stated that Dawn killed the boys and Alison, I think Alison simply wanted to set the record straight. As for me, I’m going to keep my distance. I would like to spend a night there and find out if the place is still haunted. I’m betting it is. I would sure like to know who the hooded figure was as well as the little child in the photo standing near it. It was taken in the Amityville house during a séance in the 1920’s. Have you seen the photo at all? You should find it if you type in hooded figure in Amityville. Hi, Brenda. Miss St. Claire has seen the photos. She believes they’re evil, non-human spirits–in other words, demons.